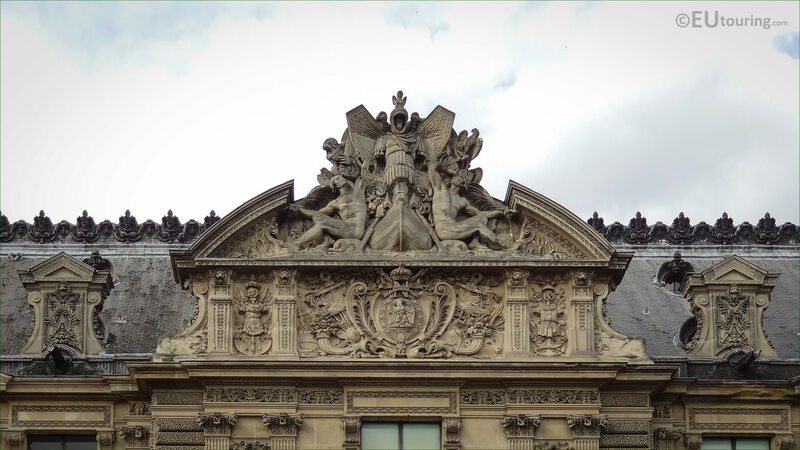 Again we were by the River Seine and admiring the facade of the Musee du Louvre called the Grand Galerie Occidental, and we took these high definition photos showing the ornate pediment sculpted by Theodore Gruyere. 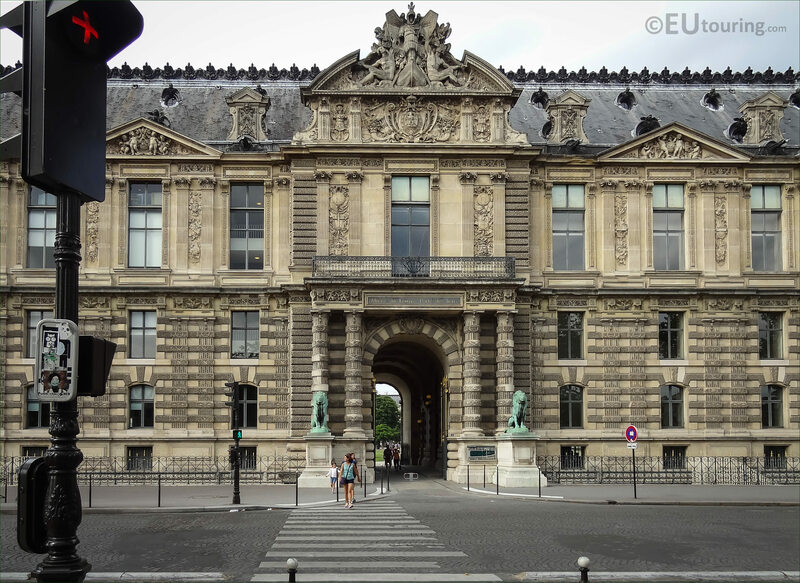 This first HD photo shows a close up of the pediment, which is called a fronton in French, and located above the entrance gate to the Cour du Carrousel of the Musee du Louvre, this was executed in 1864 when the Palais du Louvre was being renovated. Many of the pediments have an exact name or a specific meaning, however, unfortunately we have been unable to find out what this particular ornate sculpture on the pediment is called, but we do know that this was produced by Theodore Charles Gruyere, who was born in Paris and became a French sculptor studying under Auguste Dumont. 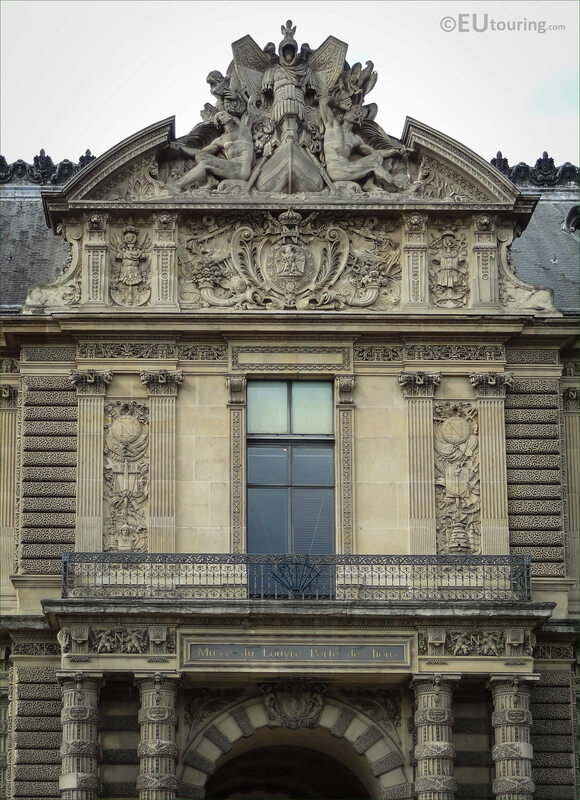 Now this next HD photograph shows more of the facade where the pediment is located on the Grande Galerie Occidentale above the Porte de Lions, which when translated into English this means the Great Western Galery above the Lions Gate of the Musee du Louvre, and this is the south facade that looks out to the Quai Francois Mitterrand and the River Seine. 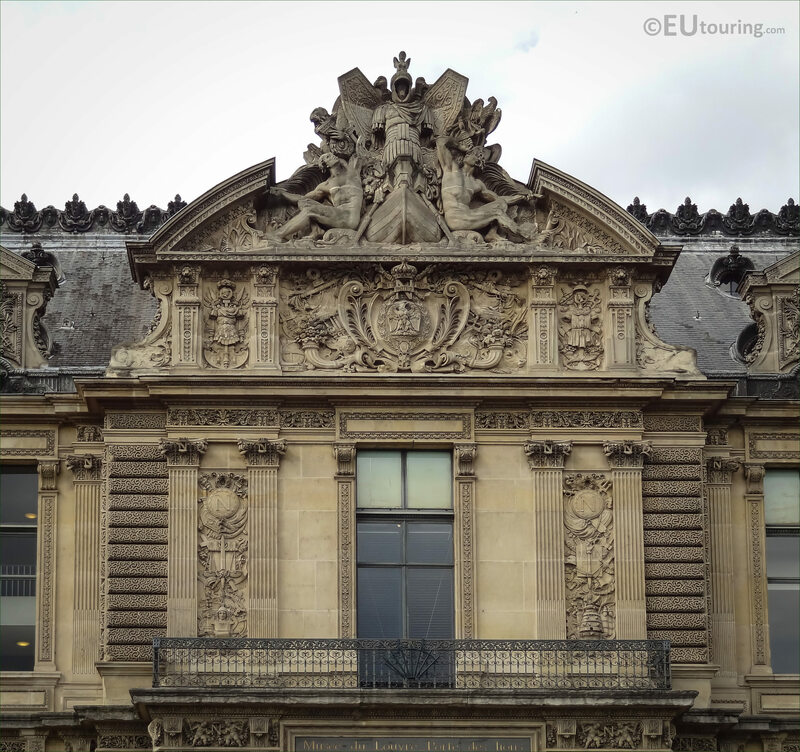 And you will find that Theodore Charles Gruyere not only produced the ornate pediment you can see in this image, but he received several other commissions for the Musee du Louvre during the restoration works that were taking place in the Second Empire. Yet he also worked on other tourist attractions in Paris such as the Palais Garnier Opera House, the Eglise Saint Germain l'Auxerrois, the Tour Saint Jacques and many more historical buildings during a successful career working until shortly before he passed away, with one of his last statues being for the Hotel de Ville in 1881.